Spring is nearly here, and that means you need to be ready for it. If you want to enjoy your outdoor spaces throughout the spring, summer, and fall, you should get a jump-start on these essential outdoor tasks. The first thing you should do once it starts getting warm is clean up any leaves, branches, and other debris that fell over the winter months. It’s important to remove old debris early so the grass underneath can get light and oxygen. Removing debris also helps avoid problems with moisture, and allows new grass to grow more easily. You should also take care to remove any mulch or debris that piled up against your house or fence over the winter. If left alone, it can lead to mold and moisture problems as well as provide a convenient breeding ground for insects. If you want your lawn to be healthy all year, you should start treatment early. Here in Texas, it’s very important to apply pre-emergent crabgrass treatment and weed killer early in the spring, before the soil temperatures get too high. If you wait until it’s warmer the weeds will begin to germinate before the pre-emergent can take effect, which makes it all but useless. It’s also a good idea to apply an early application of fertilizer to your lawn as well. This provides a “jump start” for your grass in the early months, giving it the nutrients it needs to grow strong early in the year. However, make sure you pay attention to manufacturer guidelines. Too much fertilizer can actually harm your grass. It’s tempting to put down new grass seed during the spring to repair any winter damage and help thin spots grow in healthier, but you shouldn’t reseed your lawn in the spring. Why? Because you can’t re-seed alongside a pre-emergent crabgrass or weed treatment. Pre-emergents keep all seeds from germinating, including grass seeds. If you put down new seed at the same time as your pre-emergent treatment, you’re just throwing away time and money. Instead, it’s better to wait until fall to put down grass seed. This gives it time to germinate and establish roots before winter, and then in spring it can grow alongside your more mature grass. If you have major damage you need to repair on your lawn in the meantime, sod is your best bet. If you have flower beds or a garden, spring is the best time to put down a heavy layer of mulch. New mulch helps replenish your flower beds and also provides an extra layer of protection against weeds and grass intrusion. You should also trim back any dead branches and remove debris from your garden at the same time. If you want to plant shrubs or other more frost-tolerant plants that can handle early spring weather, this is a good time to do so. One thing to note is to avoid piling too much mulch up against your fence line. Doing so can lead to problems with mold and mildew, and if you have a wooden fence it can also lead to rot and water damage. Your fence should either be fully clear of your mulch or just barely touching it at the bottom. Finally, you’ll want to inspect all of your larger yard pieces including trees, your fence, your deck, and any shade structures or lawn furniture you had out over the winter. Look for damage such as dead or broken limbs, water damage, and any staining or discoloration. Early spring is also a good time to clean your gutters and make sure your roof is in good shape for the coming rainy season. Finally, think about what you might want to do with your yard when it gets warmer. 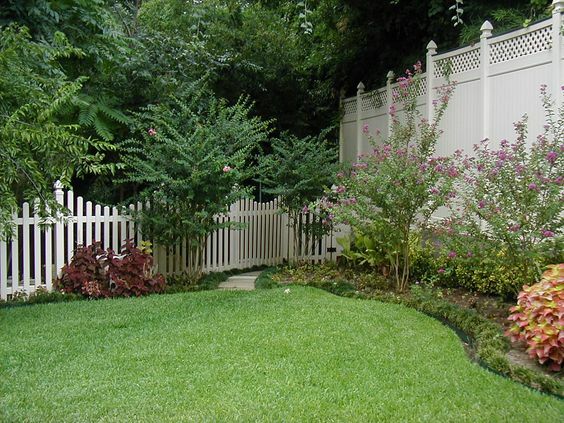 Is your current fence in good condition? Would you like to add some shade over your patio? Could a gazebo or pergola add much-needed visual impact in your yard? Spring is an excellent time to consider making improvements that will benefit you all year long. If you do think of anything you’d like to do with your yard, contact us today at Future Outdoors. We’re the number one installer of vinyl fences, shade structures, and decks in the Dallas-Fort Worth area, and we’re ready to help you make the most of your yard. Call 972-576-1600 today, or visit us on Facebook to see pictures and read reviews from other happy customers.